According to Ohio State Highway Patrol, a five-vehicle accident occurred Tuesday afternoon on U.S. 35 just north of Gallipolis. At least one individual was evacuated from the crash site by a medical emergency chopper. The pictured maroon sedan allegedly traveled westbound. For unknown reasons, OSHP officials said the driver lost control and crossed the median into eastbound traffic. It allegedly came to rest in eastbound lanes. The pictured semi was traveling east. In an attempt to stop, the semi allegedly locked its brakes in an attempt to avoid the maroon sedan. It collided with the sedan and knocked it back into the median. The semi “jackknifed” and ended up skidding into the ditch, off the roadway on the south side of the highway. Behind the semi and before the first collision, a silver Chevrolet sedan attempted evasive maneuvers upon noticing the semi’s reaction. The silver car drove into the median to avoid colliding with the other vehicles and ended up with frontal damage from clipping another vehicle. It ultimately landed in the ditch on the north side of U.S. 35. Another gray sedan swerved to avoid as it was following the silver Chevrolet. It went through the median and caused damaged itself from the bumper hitting the hilly portions in the grass. At some point, debris, which identified OSHP troopers as a battery, was supposedly launched from one of the vehicles and smashed into the windshield of a blue pickup truck traveling westbound, striking the individual inside before the vehicle came to a stop. 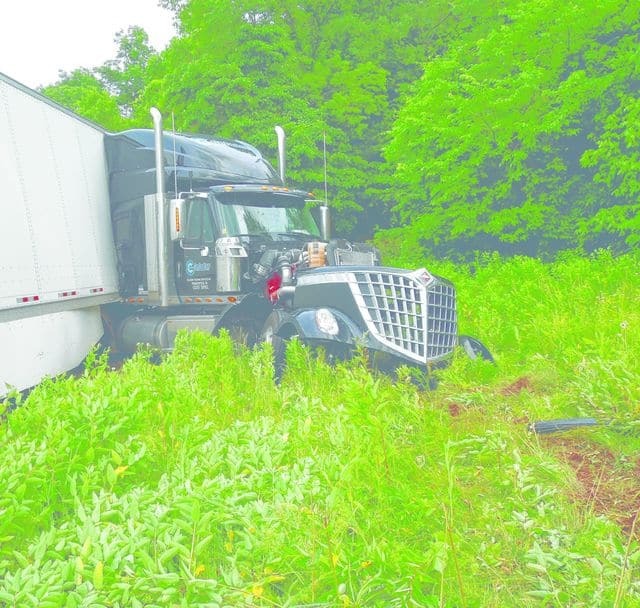 According to Ohio State Highway Patrol, a five-vehicle accident occurred Tuesday afternoon on U.S. 35 just north of Gallipolis. At least one individual was evacuated from the crash site by a medical emergency chopper. Troopers said the pictured maroon sedan was traveling westbound. For unknown reasons, OSHP officials said the driver lost control and crossed the median into eastbound traffic. It allegedly came to rest in eastbound lanes. The pictured semi was traveling east. In an attempt to stop, the semi allegedly locked its brakes in an attempt to avoid the maroon sedan. It collided with the sedan and knocked it back into the median. The semi “jackknifed” and ended up skidding into the ditch, off the roadway on the south side of the highway. Behind the semi and before the first collision, a silver Chevrolet sedan attempted evasive maneuvers upon noticing the semi’s reaction. The silver car drove into the median to avoid colliding with the other vehicles and ended up with frontal damage from clipping another vehicle. It ultimately landed in the ditch on the north side of U.S. 35. Another gray sedan swerved to avoid as it was following the silver Chevrolet. It went through the median and caused damaged itself from the bumper hitting the hilly portions in the grass. At some point, debris, which identified OSHP troopers as a battery, was supposedly launched from one of the vehicles and smashed into the windshield of a blue pickup truck traveling westbound, striking the individual inside before the vehicle came to a stop.